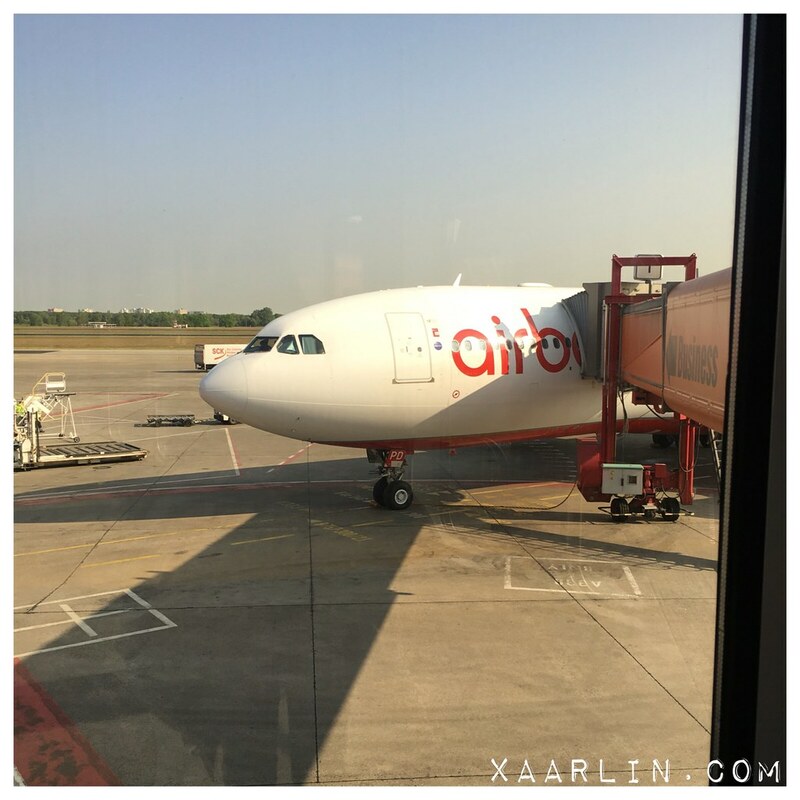 On a Friday afternoon we took Air Berlin to.... Berlin. It was a nice experience and had no complaints about the flight/food whatever. I even slept for a few hours which was amazing. 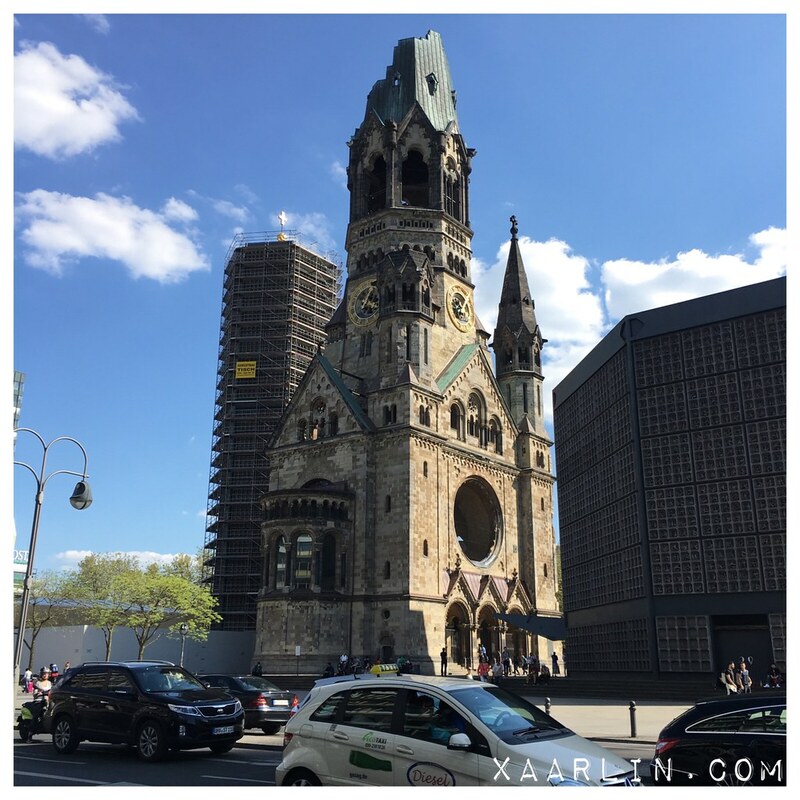 We passed by Kaiser Wilhelm Church multiple times- it was damaged by a bombing raid in 1943. 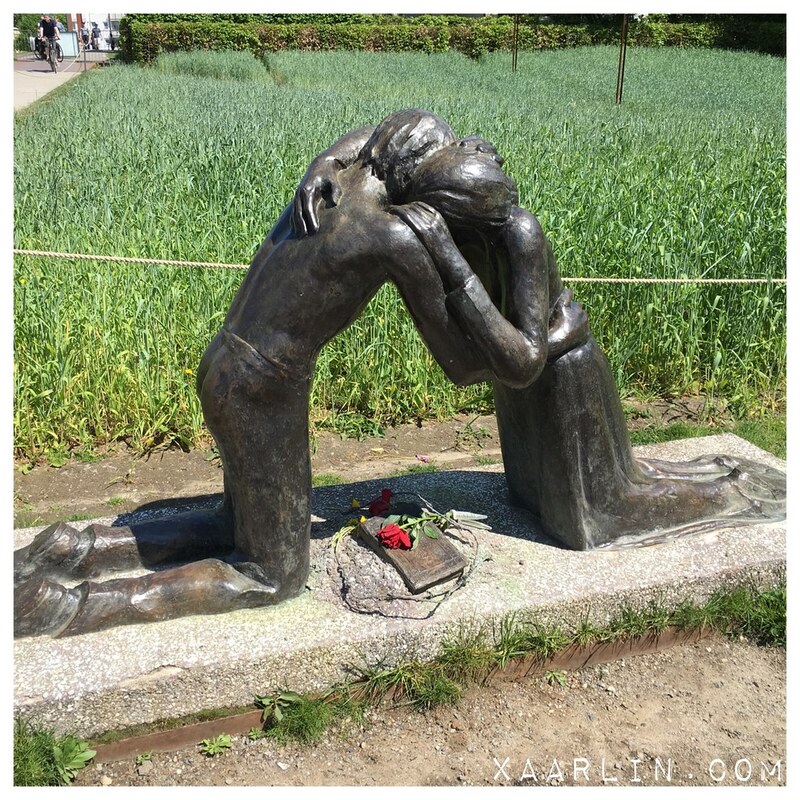 It was definitely a bit jarring to see the effects of war. 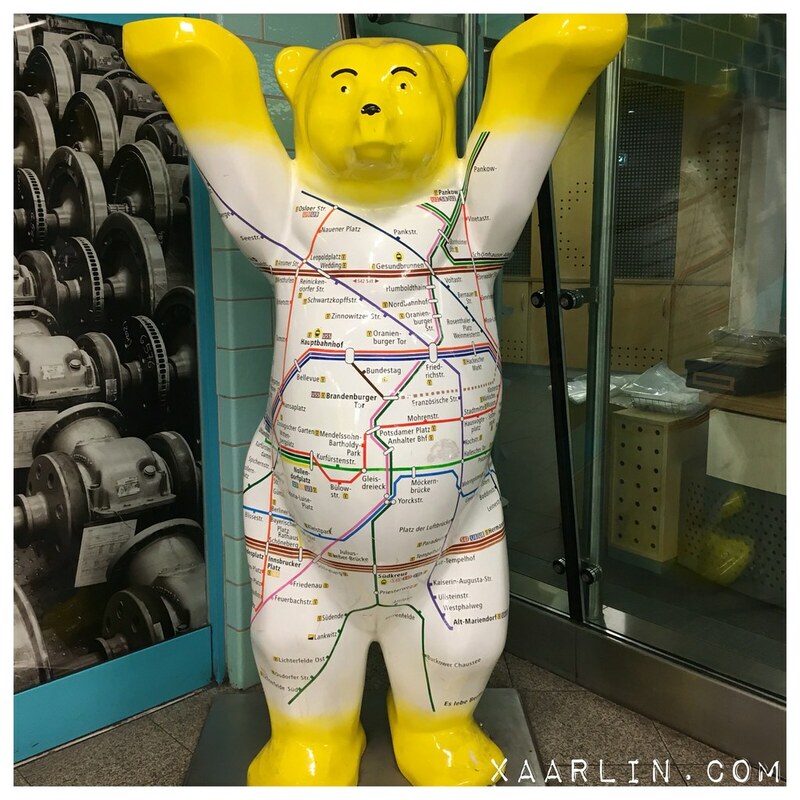 We walked around a lot and took tons of photos- and also got one with one of many of the "Berlin Buddy Bears." They are painted in different themes to promote events under the theme of peace and understanding. 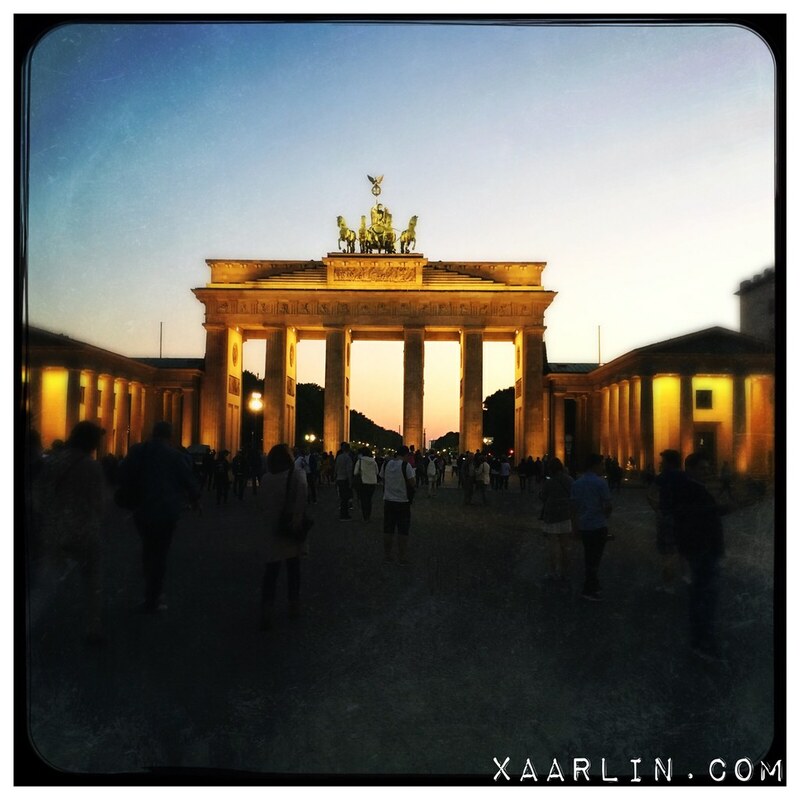 We also saw the Brandenburg Gate at dusk. It was beautiful. 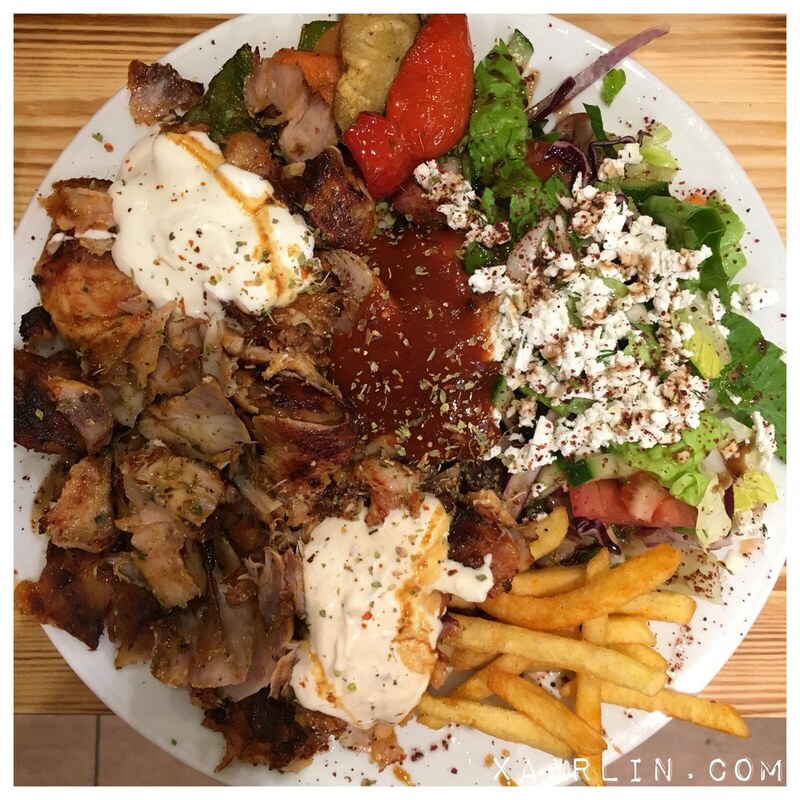 For dinner, we ate a Doner Kebap plate. 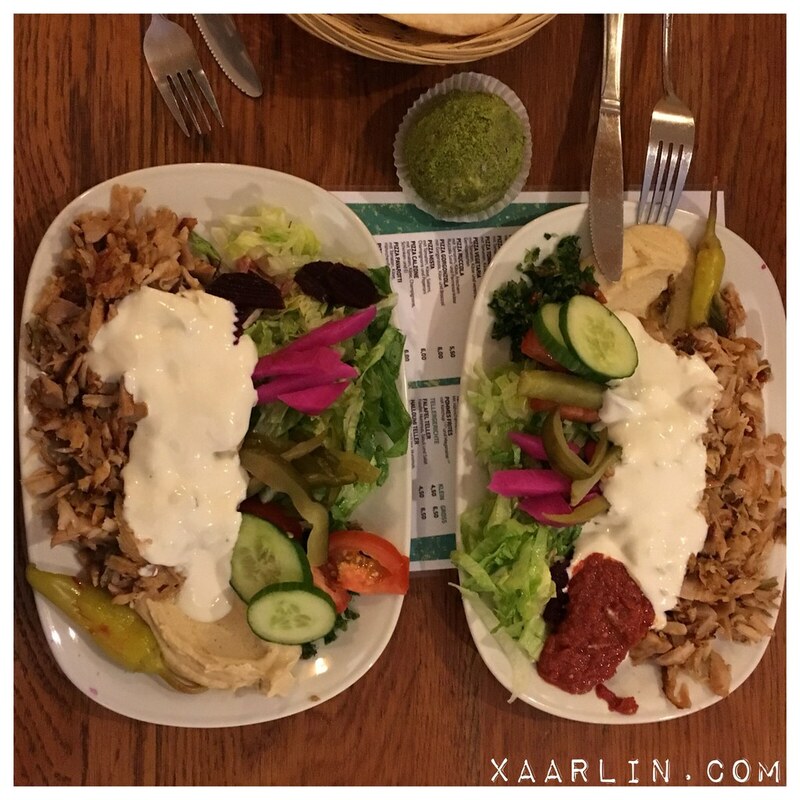 It was so amazingly delicious- I've had similar plates in the USA, but they don't hold a candle to any of the ones I had in Berlin. 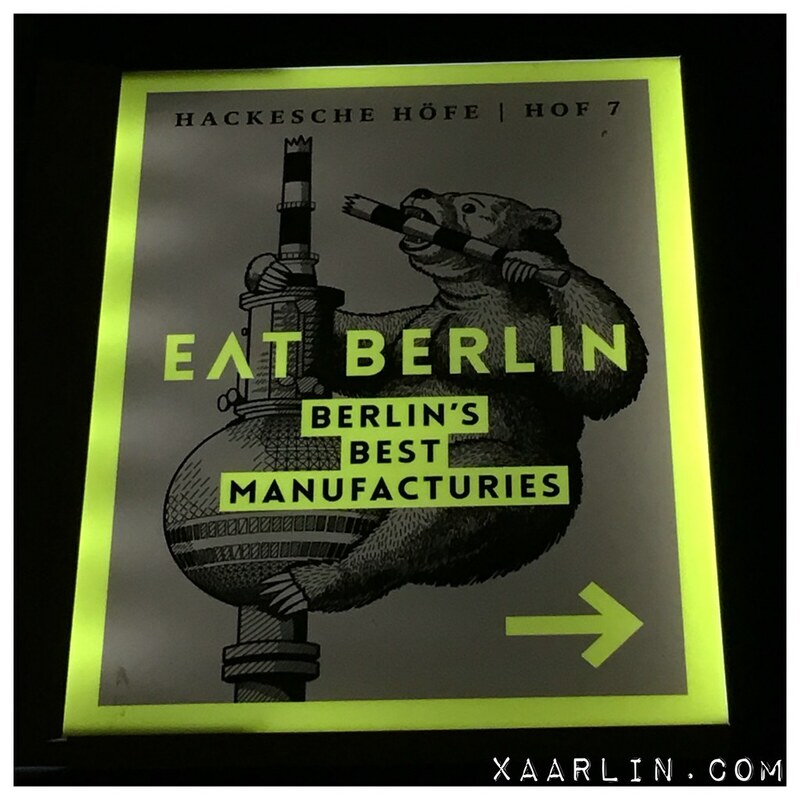 I really liked this sign- a bear (symbol of Berlin) breaking off the famous TV tower. For breakfast the next morning we went to Curry 36 and got a curry wurst and fries. I was shocked to see that dogs were allowed on the subway cars. The ones we saw riding, were so well behaved. CB would have freaked the eff out. 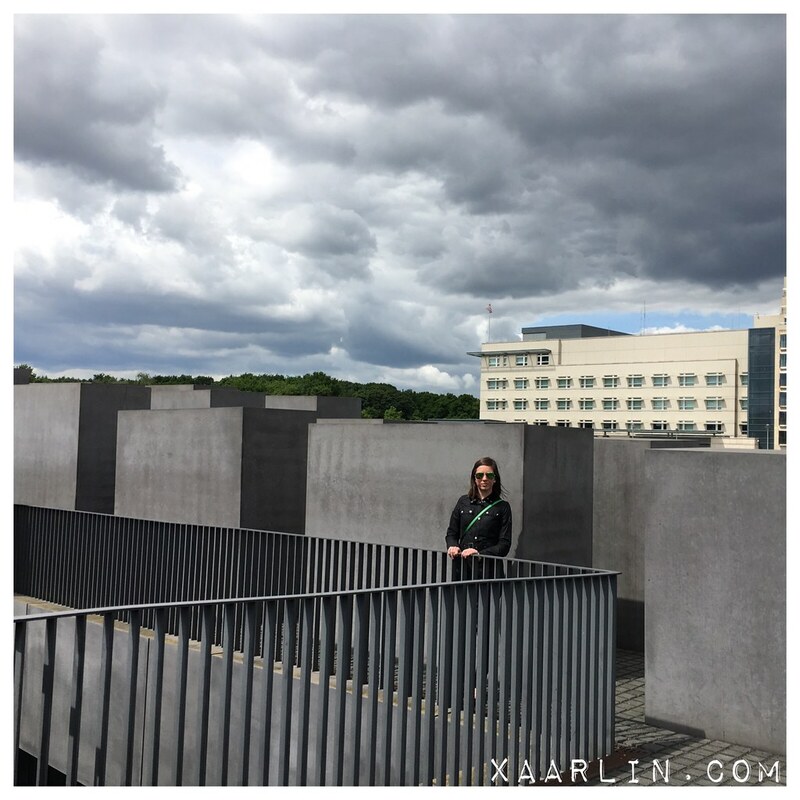 We went to the Berlin Wall memorial. I cannot wrap my mind around how Germany was split until almost 30 years ago. Families were separated and unable to visit each other- and the division of east vs west side is still so prominent in the architecture. To see these historic monuments in person was overwhelming. I cannot imagine what life would have been life before the wall came down in 1989. We walked a lot and eventually made our way to Stone Brewery. Stone is a 15 min walk from the end of one of the subway lines- it's an absolutely gorgeous space. When we visited, only the library bar was open. By fall, the main hall and outdoor space will likely be open and able to accommodate 1000+ people. 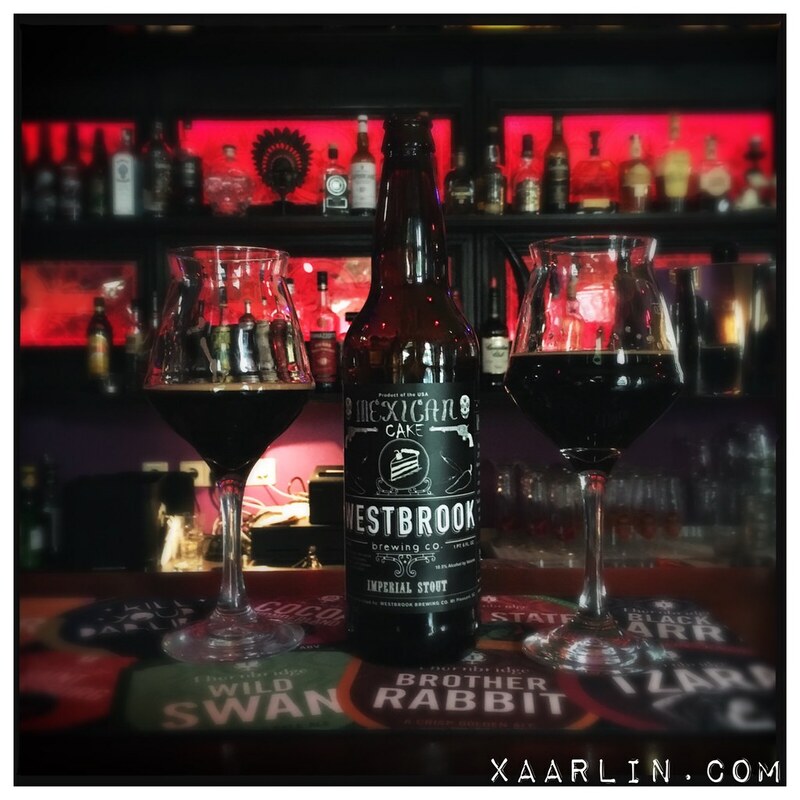 Stone has its work cut out for them since craft beer is a relatively new thing in Germany, plus the German Purity Law for beer is ingrained in most people's thoughts concerning beer. 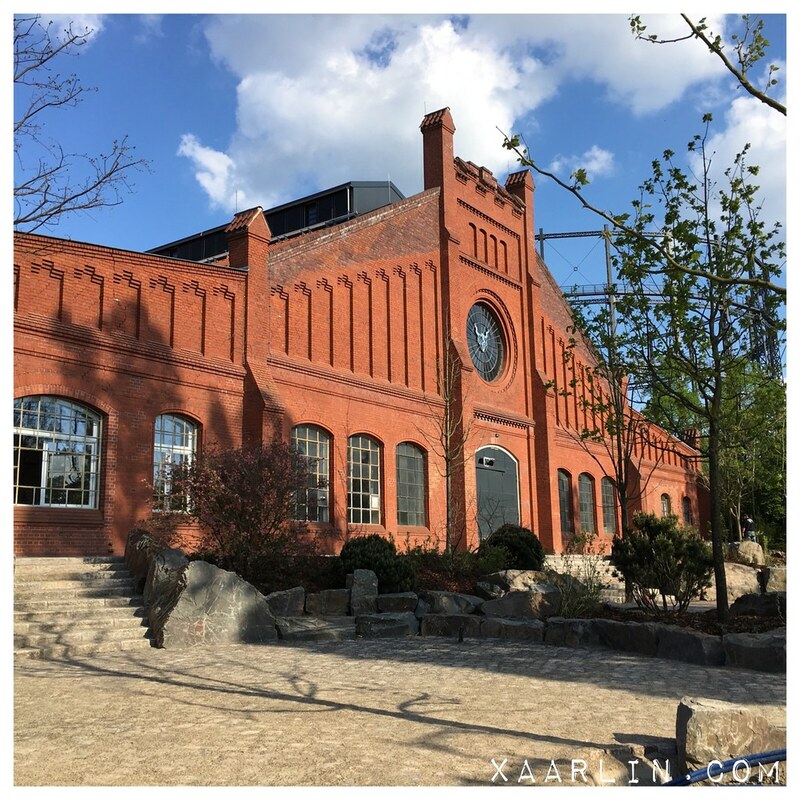 Most people love their go to Berliner Weiss, pilsners, but I'm sure with some craft beer education/acceptance, and time spent out on this amazing beer garden, it will be a popular place. We flew to Copenhagen on Monday morning- and then back to Berlin the following Monday. We stayed in a different hotel for our 2nd set of nights. Clearly this hotel was built in the East Germany side- with a very communist aesthetic. We went to the Memorial of the Murdered Jews of Europe. 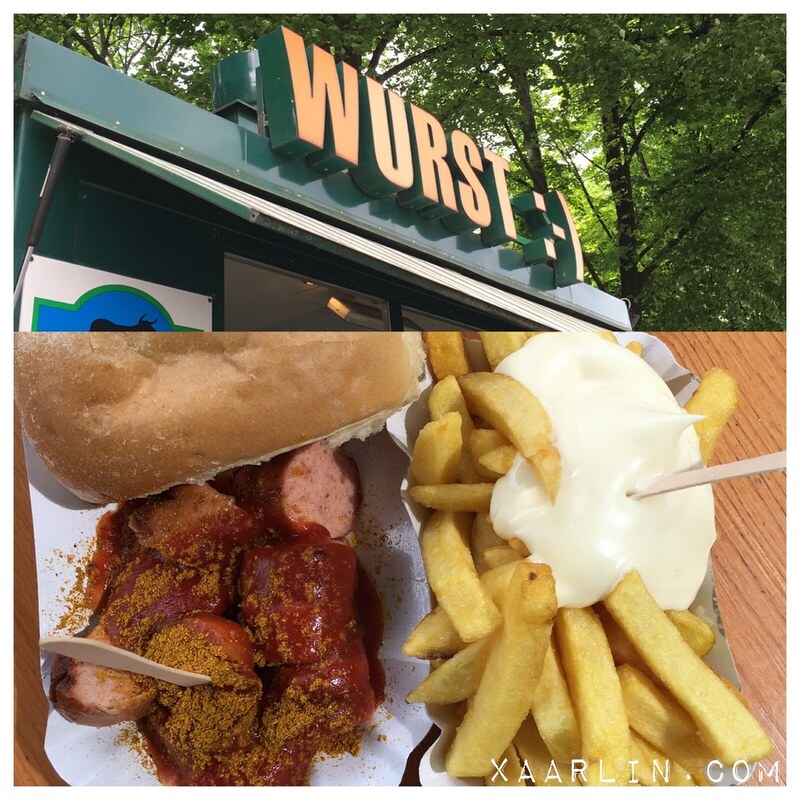 We ate more Curry wurst. And saw more buddy bears. 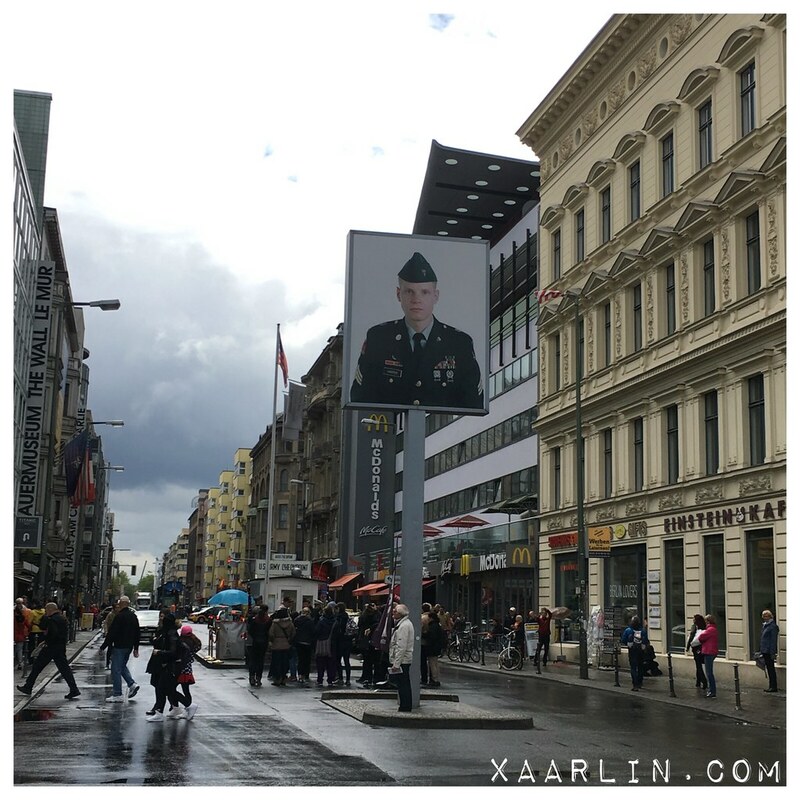 We walked by Checkpoint Charlie. 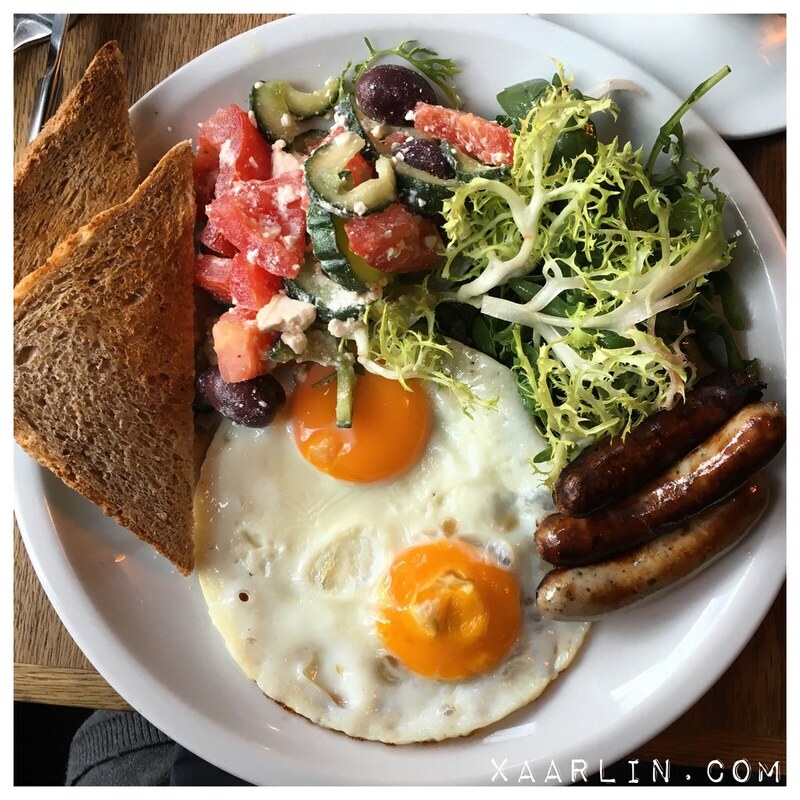 And had an amazing simple breakfast before walking around Kreuzberg. 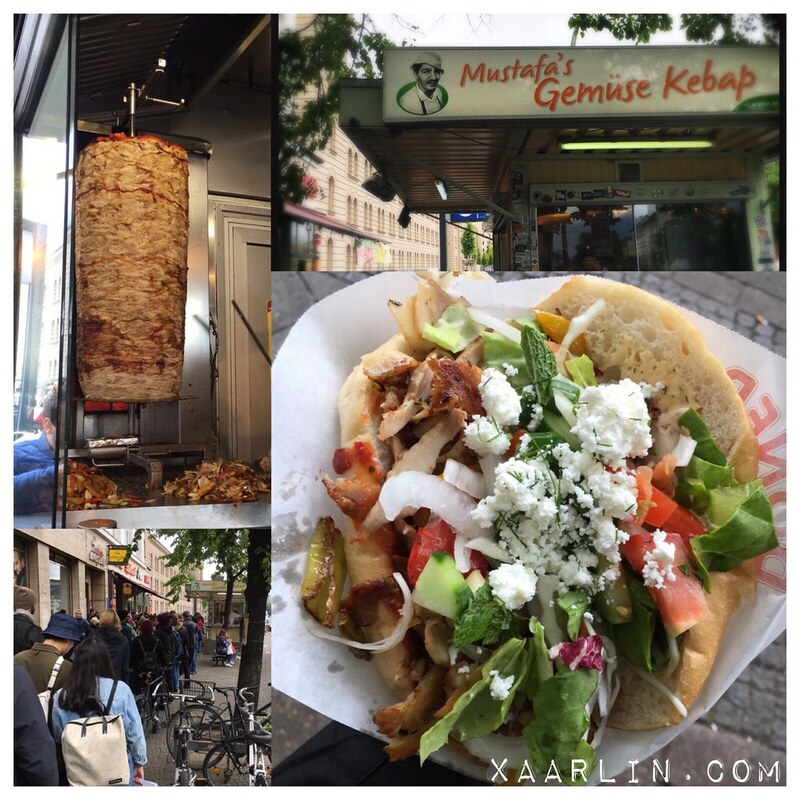 We waited in line for 40 minutes to get arguably the best Kebap in Berlin at Mustafa's. It was pretty damn good so I'd say it was totally worth the wait. We met some of our Brasilian friends who now live in Germany for dinner one night- homemade pizza- which prompted me to get a personal pizza maker upon my return because it was so good. Our last evening in Berlin, we went to Monterey Bar and had some fantastic beer and had some great conversation with the bartenders. For dinner on our last night, we had more Kebap, because it is delicious and because I haven't found a suitable equivalent in Chicago. 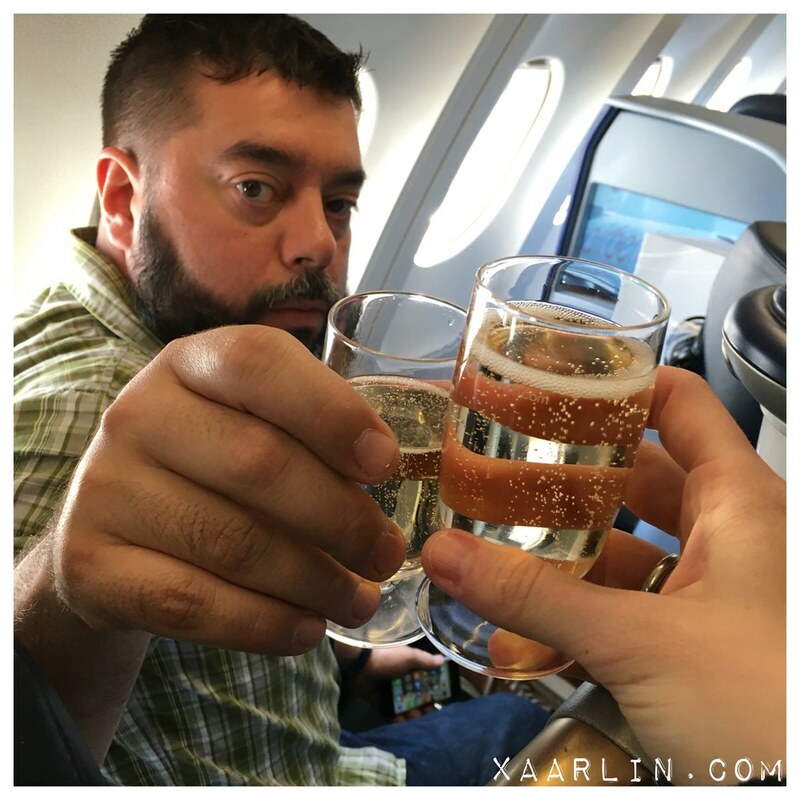 The 9 hour plane ride was long- but worth it for all of the amazing memories which I glossed over here. 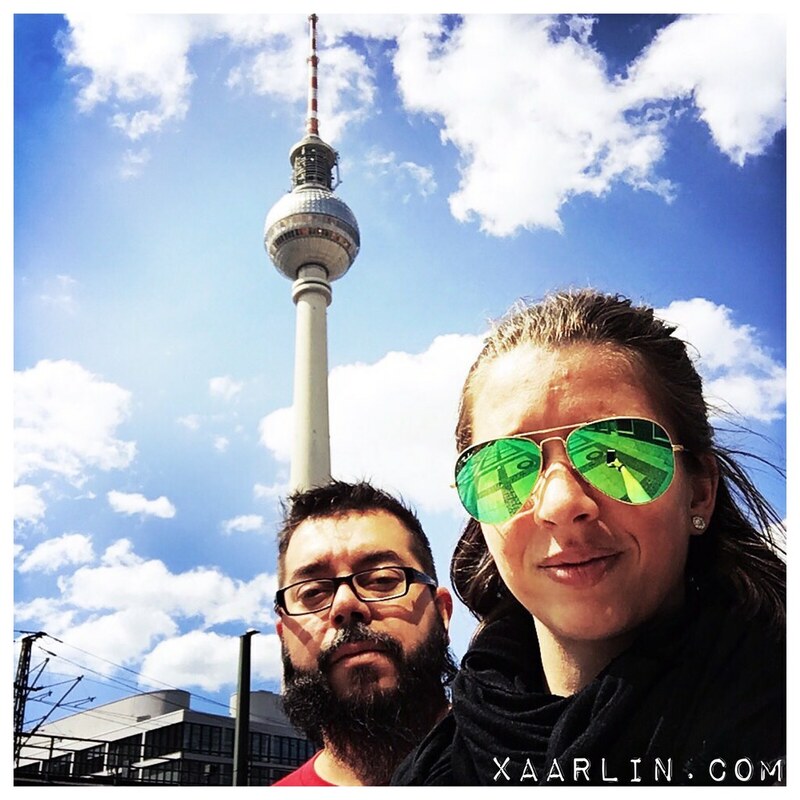 Berlin was really great. It was definitely not the picture of a traditional German city I had in my head- it was way more culturally diverse and metropolitan than I had thought. 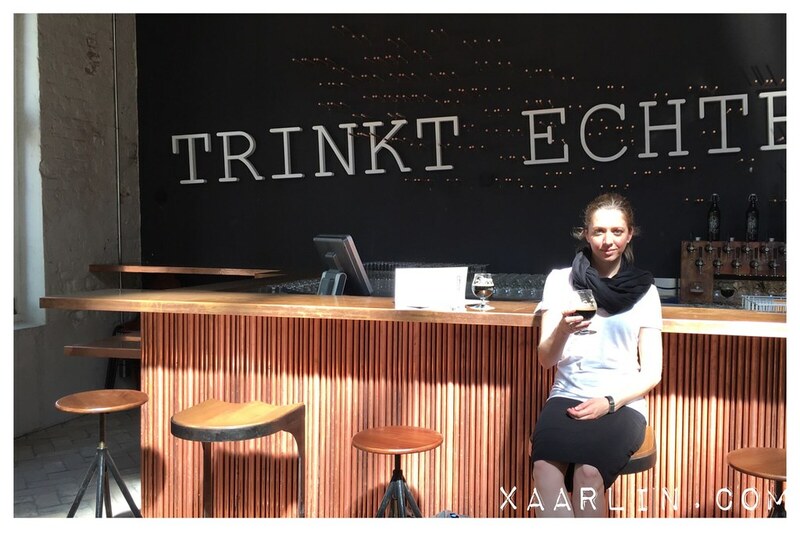 The food and people we encountered were all amazing, and I wouldn't hesitate to go back here- but I'd want to brush up on some more German words first since depending on where you go, many folks don't speak English. Duolingo came to the rescue when I needed to buy a bottle of water and the cashier didn't speak English. I'll always remember "wasser." 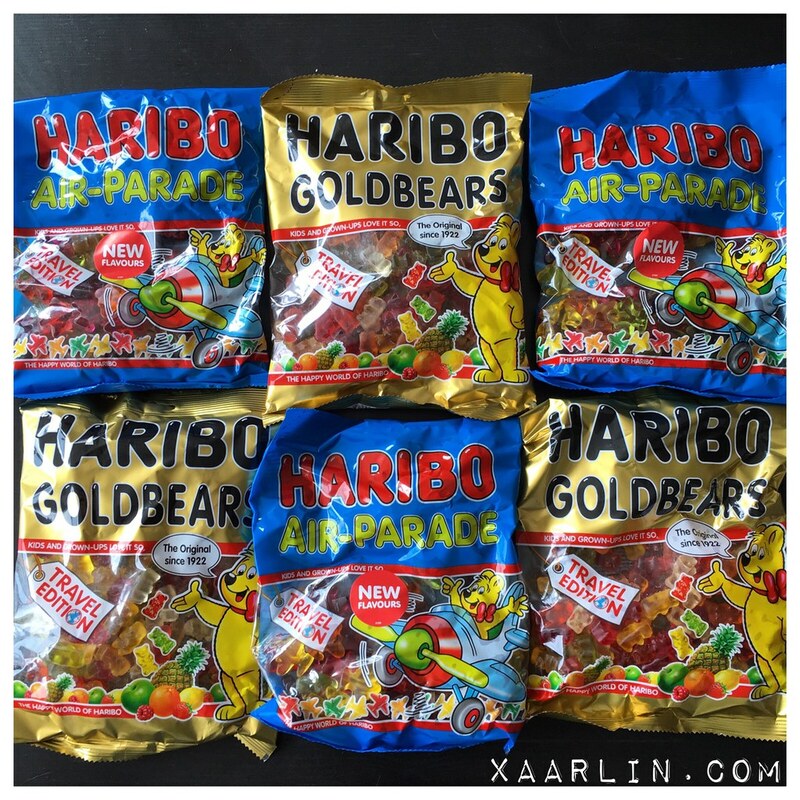 I stocked up on 3kg (6.61lbs) of the freshest gummies, but also wish I had bought some of the other Haribo varieties before we left since the airport had a crap selection. 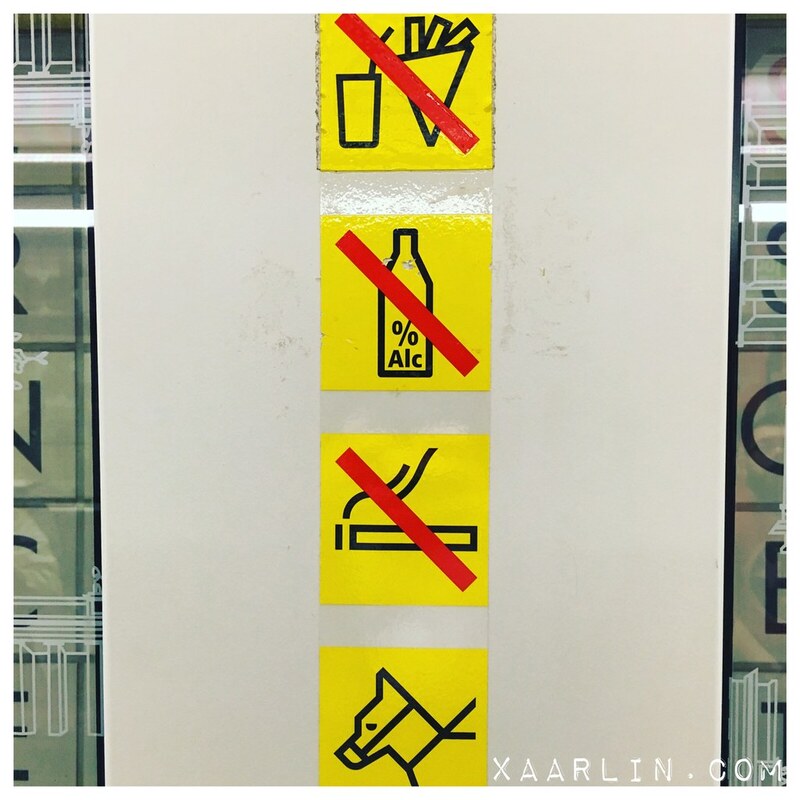 But I also didn't want to carry a ton of gummy bears around with us while walking all over Berlin. 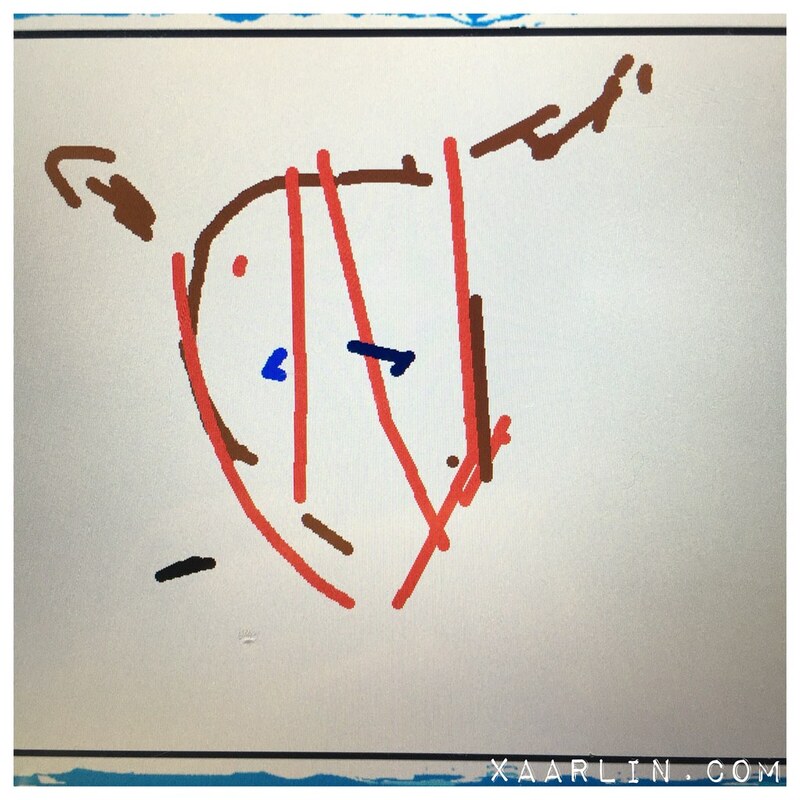 During the return flight, I drew a photo of CB on the plane because I was sick of watching old TV shows and movies. A few hours after we landed, we got CB from boarding. He was super happy to see us. We also missed him a ton. It was nice to be back. I'm drooling looking at all of the food (and the gummy bears)! 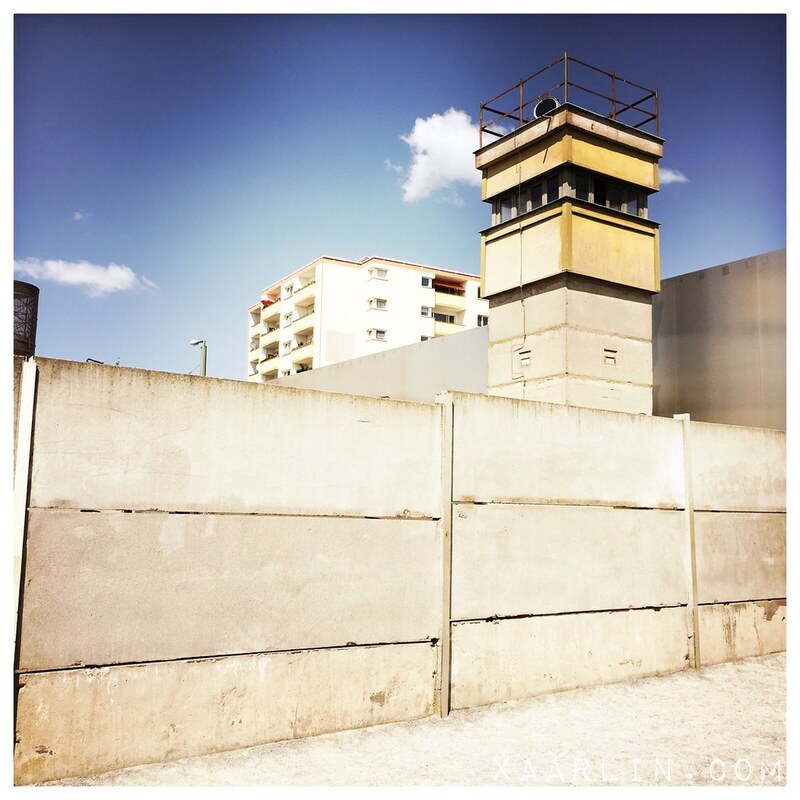 The only two times I was in Berlin, The Wall was still up. 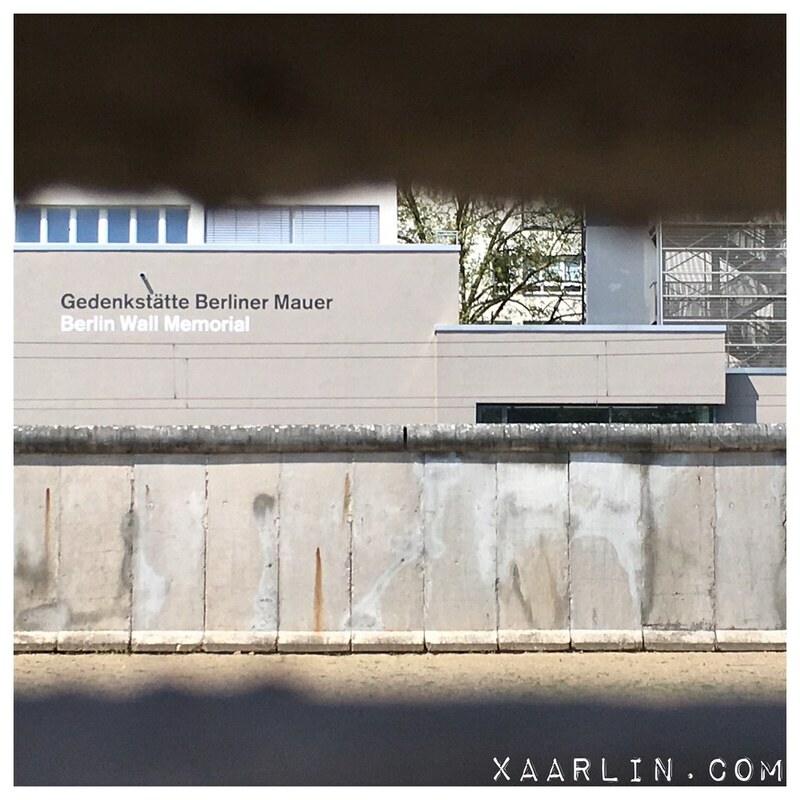 In fact I think I have pictures of the Brandenburg Gate and the Wall running right behind it! I got to go to East Berlin both times I was there. It would be cool to see how much the city has changed and eat some of that delicious wurst along the way! I can't imagine what it would have been like to visit while the wall was up. I'd love to hear more about your experiences. The food was so good. The wurst was the best ever and those Doner kebabs were out of this world. I miss the food so much. The Cold War era has always been one of my favorites to study in history, so I'd find all of the post-war and wall stuff pretty interesting. It's nuts to think that wall was still up during our lifetime (and apparently during Pete's travels there)! Wurst and kebap and bears - oh my! But seriously, yum. 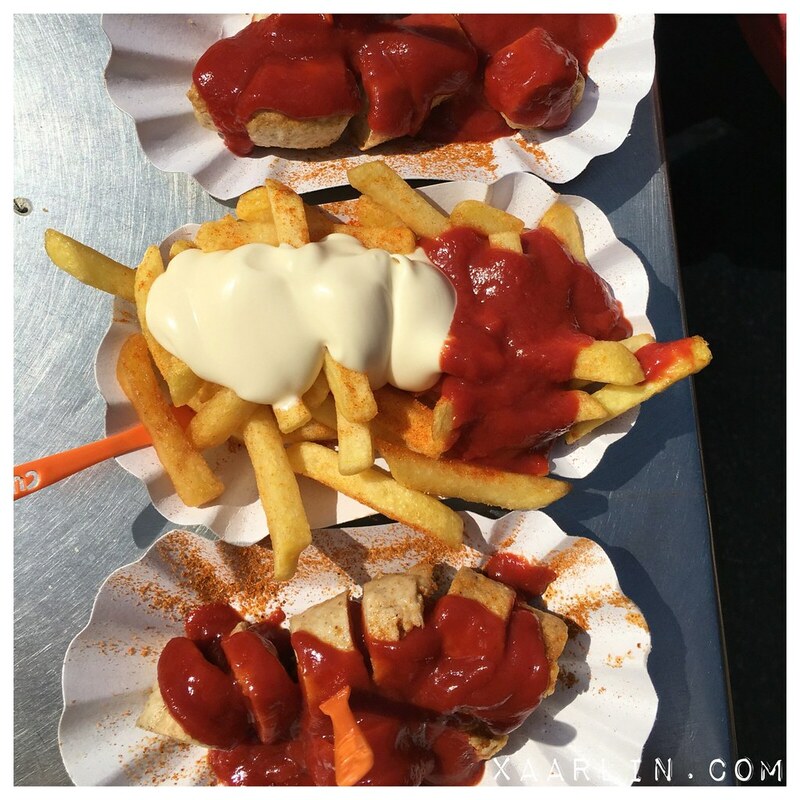 I've had currywurst in Chicago, but would love to have it in Germany. Or just go to Germany in general. I might be on a mission soon to find the best curry wurst and the best Doner in Chicago. The food was so good. 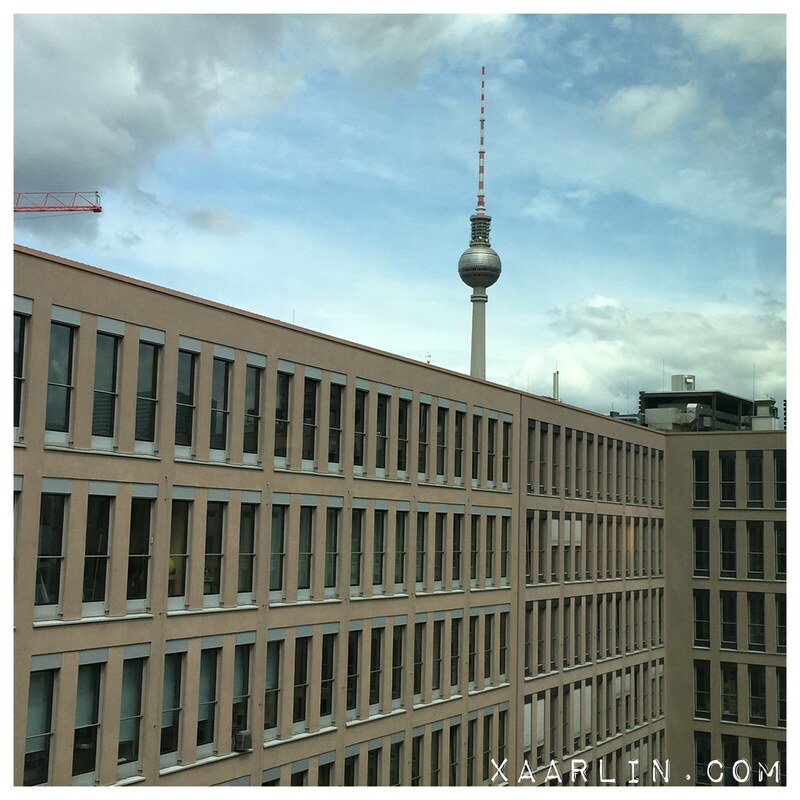 It is amazing how much Berlin has changed since the wall came down, isn't it? I am fascinated by the difference in hotels on the East Germany side with the communist aesthetic. Those doner plates look AMAZING. 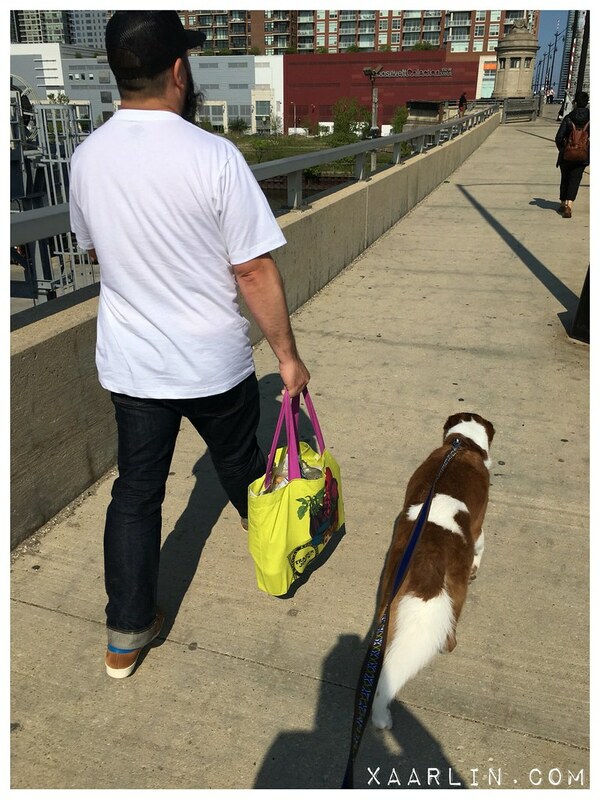 I am surprised dogs are allowed on public transit, too! CB must have been thrilled to see you and L when you got back! What is that beer law you referred to!